What happened to the dinosaurs and other ancient animals that roamed the Earth alongside them is a question that has fascinated scientists for centuries. While experts have solid theories for some of the most major extinction events in Earth's history (an asteroid hitting the planet about 65 million years ago is a popular scapegoat, for instance), there are a few famous species whose disappearance still eludes explanation. The ichthyosaur is one of them. This swimming, dolphin-like reptile ruled the waters for more than 150 million years, spanning the early Triassic period to the late Cretaceous. But it mysteriously vanished about 90 million years ago - long before the cataclysmic, asteroid-driven extinction event that wiped out so many other species at the end of the Cretaceous period. Scientists have proposed a variety of explanations, but there's been little concrete evidence to sway the vote in any direction. But now, a group of scientists believe they've shed a little more light on what happened to the ichthyosaurs. Their research , which was published Tuesday in the journal Nature Communications, suggests that climatic change during the late Cretaceous period, which likely caused great upheaval in marine ecosystems at the time, was the nail in the ichthyosaur's coffin. To conduct their analysis, the researchers combed through museum collections and literature describing ichthyosaur fossil findings to put together a comprehensive, up-to-date dataset of the many different species of ichthyosaur that existed over the millions of years the animal was on the Earth. They then conducted a special kind of analysis that investigates the links between all the different species and the way they evolved over time. In general, the results painted a picture of a diverse group of organisms that maintained a high degree of species richness with many different traits, such as differently shaped teeth or different body sizes, until close to the end of their 157-million-year reign. The analysis also indicated that ichthyosaurs suffered not one, but two extinction events - an initial event that greatly reduced their numbers and diversity during the late Cretaceous period, and then a second event several million years later that finished them off. These results are somewhat at odds with previous theories that had been proposed about the ichthyosaur's fate. Scientists had postulated that ichthyosaurs had either been out-competed for resources by other marine predators, or there was a major extinction event among the animals the ichthyosaurs relied on for food, essentially leaving them to starve. The researchers observed that the competition hypothesis doesn't quite fit with our knowledge of the types of marine organisms that shared the waters with ichthyosaurs. They were unable to pinpoint an animal that might have had the ability to outcompete the ichthyosaurs and also existed at the same time and in the same places. And the theory about the disappearing prey doesn't make complete sense either, considering how diverse the ichthyosaurs were as a group. This theory suggested that ichthyosaurs relied almost exclusively on a specific type of squid-like organism, known as the belemnite, for food. But given how diverse the ichthyosaurs were as a group, according to the new analysis, the researchers feel that it's unlikely they would have all focused on just one type of animal. So although the loss of the belemnites may have been a factor in the ichthyosaur's eventual disappearance, it probably doesn't fully explain what happened. And the fact that there appeared to be two extinction events - the second one terminal - also remained somewhat of a mystery. So the researchers conducted more tests to find out what kinds of environmental changes might best explain the ichthyosaur's demise. These tests, known as correlation tests, essentially perform a mathematical analysis to find out how well a given theory matches up with what was known about the way ichthyosaur diversity changed over time. It turns out that changes in the climate during the late Cretaceous period were the strongest predictors of the ichthyosaur's extinction. Specifically, climate volatility - that is, extreme variations in the climate during certain parts of the late Cretaceous - are thought to be the culprit. 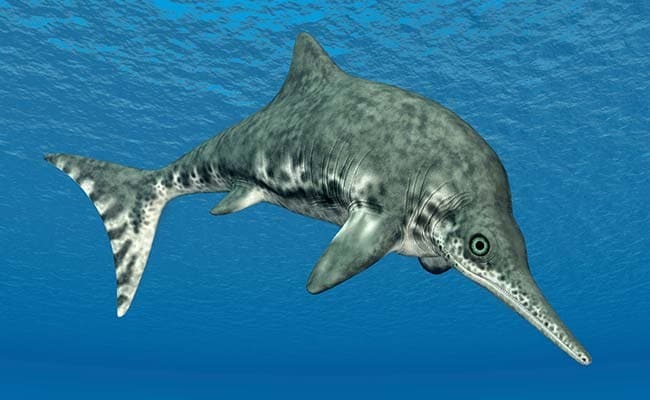 Scientists have evidence, through geological and fossil findings, that there was great environmental upheaval around the time the ichthyosaurs first started to decline, marked by fluctuating temperatures and sea levels and chemical changes in the ocean, such as the amount of oxygen and carbon dioxide in the water. All of this variability is believed to have caused profound changes in the marine ecology during that time, with many different types of animals rising and falling in dominance. The ichthyosaurs' first extinction event happened in the midst of all these changes. By the time the ichthyosaurs went extinct for good, the marine landscape had settled into a strange period - the culmination of all the climate swings that had characterized the previous few million years - marked by high temperatures, a lack of polar ice and low oxygen levels. At this point, a number of other animals also declined or went extinct alongside the ichthyosaurs. Plankton and certain types of molluscs, cephalopods and reef animals, for instance, also began to disappear around the same time, while other animals rose to dominance in their place. "As such, the abrupt yet staggered extinction of ichthyosaurs thus appears as just a facet of a much broader series of biotic events," the authors note in the paper. So it seems that the disappearance of one of the most famous ancient swimmers was not so special after all, but was likely part of a much bigger set of changes occurring on the planet at that time, largely driven by climatic changes and their effects on the ocean ecosystem. The findings may help to close the door on an old and well-debated mystery, while also serving as a reminder of the acute influence climate change has on the Earth and all its inhabitants.